The first Friday of most every month throughout 1967 and into ’68, I was formally excused from school so that my mother could take me all the way into Toronto for orthodontic appointments. As due reward afterwards, I would be treated to a tasty french-fry-and-chocolate-milk lunch in the sumptuous Eaton’s Department Store cafeteria, then left for an hour alone in the adjacent Music Department while dear mom ran her errands elsewhere. 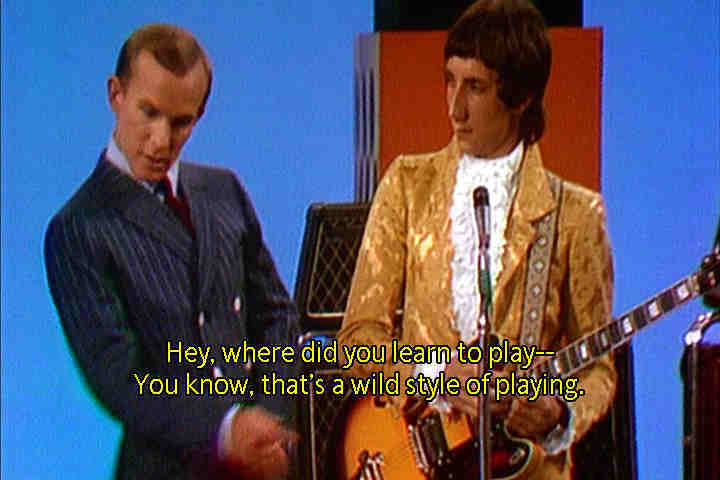 Gawd, I truly was deep in pre-teen heaven in there, believe you me: Guitars – just like the one Tommy Smothers played on TV every week! – lining each wall, while right over there were more record albums gathered alphabetically together in one place than my wide young eyes had ever ever seen. Subconsciously at least, I recognized this was sort of, for some reason, like the picture on front of my latest Beatle album. But I also instinctively gathered something BAD was afoot. Flash forward a couple’a years: By now, my comparatively straight teeth and I were enrolled in the local high school, specializing in Fine Arts and pouring over my latest charcoal still-life when the most incredible music suddenly burst from the record player at the back of the room. It was Eric Shelkey’s turn to bring vinyl in to accompany the day’s lesson y’see, and Eric, being by far the most freeeky, out-there student in all our Grade 9 Specialty Art class (I mean, the guy wore little round eyeglasses just like John Lennon, and his hair actually reached below his shirt collar!) certainly did not disappoint with his choice of music. Yep, instead of the usual docile strains of Tommy Roe or, at worst, Blood Sweat and Tears, the room was this morning filled with fully-stereophonic snorks, wheezes, electronic noises (much like those the microphone made in the auditorium downstairs when it wasn’t working), and some creepy voice which kept whispering “Are you hung up?” over and over again. Understandably I suppose, just like my mother had back in Eaton’s music department, our usually pretty patient art instructor Mr. Pollard walked quickly to the back of the classroom, turned the volume all the way down, removed the offending twelve inches from the turntable, inserted it back in its sleeve, and told Eric he could pick his record up after class, thankyouverymuchnowpleasegetbacktoworkeveryone. Of course, me being me, I made sure to follow Eric out into the hall afterwards to find out the name labeled onto the middle of this wondrous, forbidden twelve inches. Most obligingly indeed, but being careful to check both ways first to see if anyone was looking, he pulled the album slowly from his portfolio case. AND THERE IT WAS. That same diabolical image which had haunted my post-orthodontic Fridays all those years ago! Winking most conspiratorially, Eric invited me over to his place to listen to the entire record that day immediately after school. I naturally began saving up my allowance and bought my OWN copy a couple of months later, locked myself in my room… and it would be quite some time until I ever listened to Pisces, Aquarius, Capricorn and Jones Ltd. – or anything else, for that matter – quite the same way ever again. 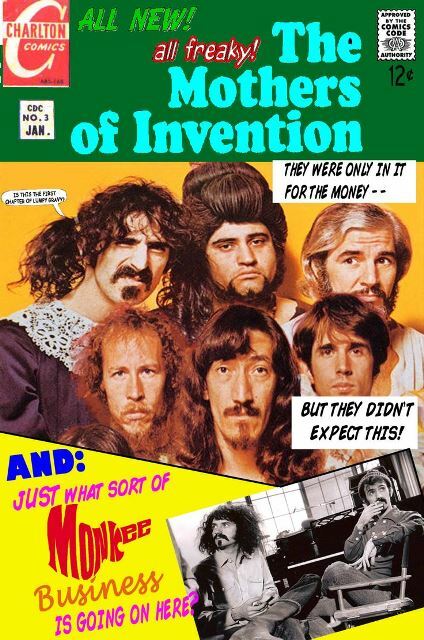 I couldn’t say it then, but I surely will now: Thank you, Frank Zappa. Especially for your music. Especially for that one particular album released a full half-century (!) ago this very month.